Sprinkle the shrimp with 1 tbsp of cajun spice and toss well. Drizzle the flour over the shrimp and toss in a bowl to make sure each shrimp is covered in flour. In a deep skillet add the butter and olive oil and heat over high heat. Add shrimp and cook on each side about 2 min until crisp. Remove shrimp from the skillet and set aside. In the same skillet add chicken broth and heavy cream. Season with additional cajun spice if preferred and/or salt and pepper. Bring to a boil then add the Parmesan cheese and whisk. 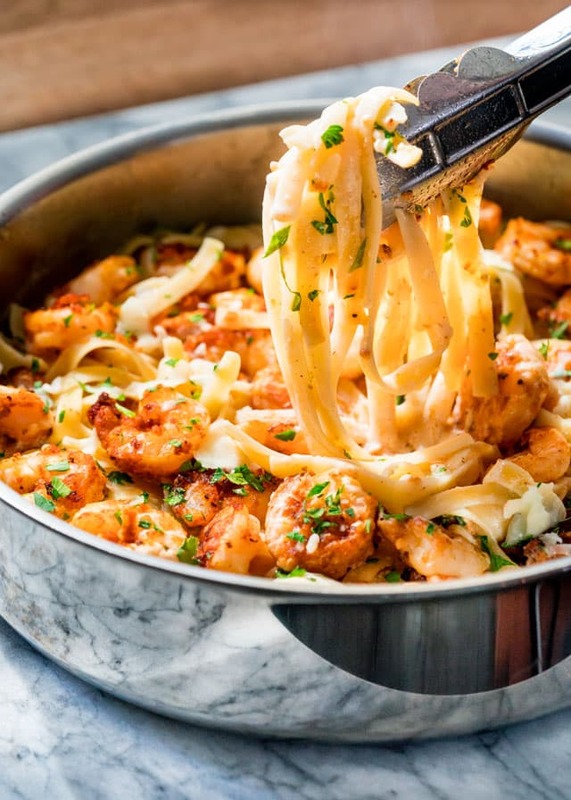 Add fettuccine and shrimp back to the pot and toss. Garnish with parsley and additional Parmesan cheese. Try to buy a cajun seasoning with no salt to avoid making this recipe to salty. You can use cubed chicken for this recipe instead of shrimp. 0 Response to " CRISPY CAJUN SHRIMP FETTUCCINE"